We are grateful to every volunteer who joined us and shared her or his abilities with us. Here we leave room for them to tell about their experiences joining our foundation. The philosophy of Miteri emphasizes on living together harmoniously and mindfully. 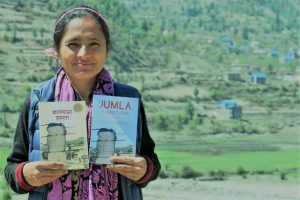 Radha Paudel, activist and author, pieced the philosophy together after surviving the trauma of Jumla attack in 2001 and while volunteering in the region afterwards. According to her, “Miteri is an ancient indigenous practice across Nepal regardless of caste, class, region, religion where mutual love and respect operate beyond blood and marriage relationship for the goal of living in togetherness. The birthplace and situation of an individual is not by choice. Miteri is a proven tool for peace and justice by connecting people from various strata and levels, reflecting and rethinking the deeds in past and encourage people to seek the reason of being born as human being in this wonderful world.”Jumla is a wonderful place to realize the meaning of Miteri– the life-style, the people and scenery all allow a person to ponder not only one’s existence but also existing among others. Or so was my experience. I went to Jumla to mainly learn what the health-care and education looked like in poor and rural areas of Nepal. However, in this journey I learned so much more than what I had set out to learn. Jumla provided me with amazing introspection that I had denied myself for many years. It was easier to distract myself with the empty busyness of my western life, than to think about personal goals and morality. To put it in over-used terms, Jumla allowed me to actually stop and smell the roses. At first, transitioning from the comforts of the U.S life to minimalist living in Jumla was unsettling to the say the least. Walking up to my host-family’s house, I felt my mind freeze with anxiety. I doubted my strength to stay at such location for a whole month. However, I put my mind at ease by focusing on the beautiful scenery around me. The house was made of mud, lacked running water and windows, but it was amidst raw and beautiful nature. It overlooked a deep ravine, and I could even make out the mountains in the back. The hills were dark green had scatterings of cattle lazily grazing throughout the day. I made a note to myself to soak in the beauty. If I was to part with air-conditioner, phones, internet and hot showers, then I needed to actively appreciate what is around me. In fact, there was a lot around me to be appreciated. Without internet, laptop or TV, I had time to reflect on myself and my surrounding. To maximize my reflection, I also started journaling my thoughts and my activities. When I just sat, and marveled at my enchanting surrounding, I fell in love. Once in love, it is obviously very difficult not to care! It is such a simple but crucial aspect of the Miteri philosophy. Stop. Reflect. ENJOY. When one takes the time to engage themselves and become vulnerable in nature or whatever surrounding, then that is when one starts caring. Miteri philosophy applies to respecting nature and caring about the environment. Living in peace includes being in equilibrium in nature. The Miteri philosophy asks to love and respect everyone despite their background, but truly loving another cannot be done without loving oneself first. For me, loving myself meant giving myself time to ruminate on my feelings so I can understand them and then move forward. Loving myself also meant accepting my flaws, inside and outside. It is what it is. I fell into this habit in Jumla because there were no mirrors in the house. Here, I wasn’t forced to look at myself in the mirror every time I washed my hands, went to the bathroom or turned the corner, unlike most U.S homes. I couldn’t believe how easy it was to not care about how I looked when there were no mirrors around. I lost my vanity just like that. The more I devalued outer beauty, the more value I placed on inner. This is when I began questioning my morality and my involvement with the world around me. I enjoyed this! It made me feel proud to finally feel like I am becoming the person I always wished to be. Loving myself probably came easier because I was also shown so much love in Jumla. I was amazed with the kindness my host-family and the community showed me. At the time of my visit, the family consisted of Keshav Dai (brother), his wife (bhauju), his son (Omkar), his brother, his sister (Laxmi) and her daughter (Pratima). When I arrived, I was led to the living room area swarming with flies. I couldn’t believe that people have to live this way. Yet, everyone had big smiles on their faces. They were happy to share what they owned. I believe this is a rare quality in this world, not a lot of people are eager to adopt a stranger into their home and treat them as their own. My host family sincerely loved me, and wanted the best for me. I found it so overwhelmingly amazing. I was later led to my room, a small windowless area where I had to bow my head to avoid hitting my head. Towards the end of my stay, I learned that they had offered me the best room in the house. The room was all for myself too. Everyone else shared a bed, and had worse conditions to sleep in. Keshav and his wife slept on the floor. I have never felt so respected and honored, and from those feeling rose my own unconditional love for that family. As Radha didi talked to me about the Miteri philosophy, this instant popped in my head. In order to live harmoniously amongst other, everyone needs to respect and love each other as human being. I do not know if Keshav’s family treated me kindly because I was an educated foreigner, but I truly believe that they would behave similarly with any of their guests despite education, ethnicity or status. His family adopted me as a sister, and I was beaming to belong to such a family. I wondered why most people in Kathmandu and in the U.S hesitate to immediately become close and vulnerable with people. It struck me that most people in westernized society are too immersed in materialism to enjoy the company of human beings. That might sound extreme, but there is truth to it. There is an emphasis in western culture on independence, and “yours” vs “mine” concept that deters people from appreciating and immersing in togetherness. The family in Jumla struggled with money, but they had happiness in community and people. When people in western cultures struggle with money, then there is difficulty seen in deriving happiness from family and community. Miteri applies to micro (self, family, community) situation and macro (society, country, world) situation. The concept embodies a non-violent peace movement because its foundation consists of respect, love and mindfulness. Violence does not even come into equation when respect and love are evolved. Radha Didi (sister) always says that lack of war does not necessarily mean there is peace in the community. Peace includes lack of violence but also includes equality, education, nutrition and health. So how can we use Miteri concept to achieve this meaning of peace? We must come back to the meaning of Miteri– equality despite race, ethnicity, background, education, caste or status, and love, respect and mindfulness for everything. With this concept in mind, people have a mantra to reflect when facing various conflicts whether its conflicts in work, family, community or politics. While fighting for social causes, Miteri advocates respecting and loving the opposing force while trying to understand them. Debates and disagreements can only be settled when people act in love and understanding. Otherwise, they’re bound to give rise to hatred and resentment. Therefore, Miteri is a non-violent peace movement. Miteri recognizes every human as equal. If one child receives world class education in one region, then it is unjust for another to be in an education-standstill due to the poor education quality. This is what I witnessed in Nepal. Schools in Kathmandu were providing children with innovative, competitive education, while some middle-schoolers in Jumla don’t even know basic math and English. In an ideal world, policy-makers would recognize the dire need for equal education ALL over Nepal, not just Kathmandu. With Miteri, they might even picture their own children attending Jumla’s poor school and feel driven to incite an immediate change. This is the hope with Miteri– inspire closeness to incite change.Miteri knows no national boundaries. It can be practiced anywhere and is applicable in all situations. As a United States residence, I can speak for certainty that the political climate be more certain if the leaders embodied some concepts of Miteri. When acting out of love, respect and mindfulness, people have more empathy. With empathy comes understanding of one another. When we even begin to attempt understanding others, that is when peace settles in. My name is Eva, I’m 28 years old and I’m from Germany. After finishing my medical studies and before working as a doctor in a German hospital I wanted to take the chance of getting to know something very different. Having heart a lot about the fascination of Nepal I was eager to get to know that country – not only as a tourist but in more of its facets. So, I was very happy that a friend of me knew Radha and put me in contact with her and the foundation. That gave me the great opportunity to be part of the team of the newly founded Radha Paudel Foundation from 1st August to 30th September 2017. As I am usually working on the practical side of patient care I was glad that during that period I had the possibility to change my perspective by dedicating myself more to the organisational and administrative part. Since I see my future not only working in German hospitals but also in development cooperation in the health sector this was an important experience. During my voluntary service, I was in charge of developing a website for the foundation by creating a concept and a structure and subsequently realizing it. 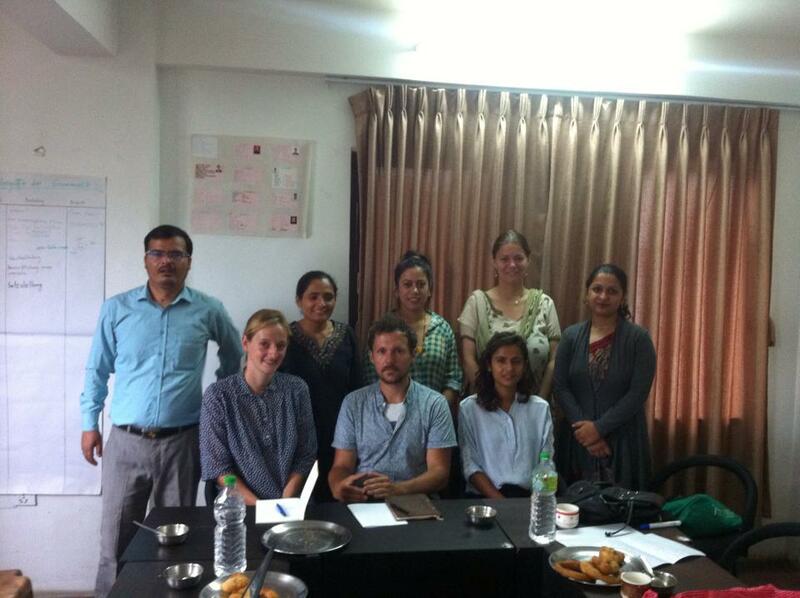 Meanwhile I coordinated my work with my Nepalese colleagues to keep it running after my stay. Furthermore, I worked on the content of our webpage. Therefore, I accompanied Radha in meetings taking photo and video material with which I worked afterwards. That allowed me to also gain an insight into thematic aspects of her work. I really enjoyed being integrated in the team as well as being able to organize my work independently. I learned a lot about the country, its culture and its people. Radha’s work is highly inspiring. I truly believe in the changes she creates every day and I am very happy that I was part of her work for a short episode. This past month, I was fortunate to accompany Radha Paudel on a five-day trip to the Jumla region of West Nepal. I was introduced to a number of local communities and Radha’s social development and public health work, and I was given some perspective, both as to progress being made and areas where much more progress is needed. It was a uniquely gratifying and touching experience. I met Radha years ago through a mutual Nepali friend. 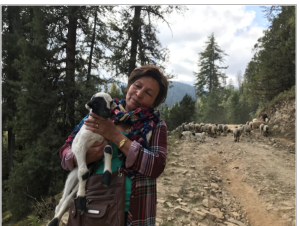 She had been planning this trip with a few of her acquaintances (among them, other nurses also involved in Nepali public health) to hand a birthing center in Jumla over to the local government. She invited me along, as I was already in the Sindhupalchok region in East Nepal working with an NGO. I have no medical background, but I had heard about her work and was eager to join. We initially flew from Kathmandu to Nepalgunj. Our flight was extremely delayed, forcing us to stay with a family member, drive the next day to a different airport, and fly to Jumla a day late. From the city of Jumla, we drove several hours and then hiked a few additional hours to the village where the birthing center is located. My first lesson was the difficulty of transportation into and out of these rural regions. The mountain roads are dangerous, bumpy, dusty, and very uncomfortable for anyone accustomed to robust infrastructures in more developed countries. I began to appreciate the importance of local health facilities that allow people to seek treatment without making these arduous journies. The next day, we viewed the birthing center and participated in the ceremony. Radha was instrumental in the construction of the center and spoke to the locals at length. I do not speak Nepali, but I observed that Radha commands great respect and closeness with the locals. She has a history of connecting with, living among, and educating the people whom she serves, and it was evident that those present were grateful for her presence in the community. The hand-over ceremony follows one of her key principles, creating sustainable solutions wherein local communities need not continue to rely on external entities and NGOs for support. I understood that this particular region was very much in need of this center, which by this time was serving the local community extremely effectively. I was able to introduce myself to locals at the ceremony and partake in the Tika. The community members welcomed me with warm embraces and smiles, consistent with my experiences throughout Nepal. It is a testament to the human spirit to meet such loving people amidst great need and hardship. We next traveled North to Rara Lake, a beautiful and pristine national park, and I appreciated the chance to see more of the country before we returned to the city of Jumla. In Jumla, we received a tour of the city, beginning with a peace monument that Radha had erected in memory of the Nepalese Civil War. The peace monument was beautiful, but unfortunately in a state of disrepair and hidden away on a remote hillside. I was not aware of the war (which was against a Maoist regime in the late 90’s and early 2000’s) until my first visit to Nepal in March 2016. It saddened me then to think how readily one can overlook tragedies in remote places. We continued on to view a police station that was attacked in 2002 when Maoists lay seige to the city, as well as the house nearby where Radha hid during the attack. By the time of this trip, I had already read Radha’s book, “Jumla,” which describes her experience. It was surreal to stand in these locations where I knew that people had been murdered within my own lifetime. Finally, we visited the primary health center in Jumla. The facilities were more robust than I had expected (for example, housing X-ray and surgical equipment) but still deficient by Western standards. Numerous patients were sleeping outside on the ground in the sun, waiting for treatment. In an enclosure with beds, I was informed that the center had insufficent resources to wash bedding between all patients. And a building on the campus was sitting idle, apparently ravaged by a recent fire. I returned to Kathmandu the next day, but I hope to return. Much of the trip pushed my comfort zone, but I feel extremely lucky to have joined. Those of us fortunate enough to visit such communities can ideally assist them in pursuing sustainable, locally-driven progress. Radha’s work demonstrates as much. I highly recommend others to connect with her or seek other opportunities to aid and explore this lovely country. Conquerors of Sannigaun (Jumla) and Pristine RaRa (Mugu) 2017. Today we live in the world of dream and we envy every successful people in the universe. Unfortunately not all the dreams are conquered how hard one strives. BUT I feel one of those privileged people that dream turned genuinely in to real existence through the hard work of local people, Radha Paudel, SNS Hastings,NRNUK, AWoN and most importantly ANM Sharada Rokaya who is the icing in cake. We set out for Jumla on October 15th at 8am but we were 5 hours delayed in Kathmandu. Eventually we arrived Nepaljung at 3pm and flight to Jumla left at 2pm. There was no certainty of getting another flight to Jumla from Nepaljung on 16th October on time to attend the handover ceremony scheduled at 2pm. We managed to chartered a plane from Surkhet at 12 noon and travelled straight to Sannigaun in the evening (3hrs rough terrain and 3 hrs walk). Three Nurses, one medical student from San Francisco, 1 businessman from Texas, 1 (Lawyer) Chicago and my respected Daju. Below view from the plane on the way to Jumla. Radha on horse ride which ended up in disaster causing injuries not serious but bad enough to restrict her mobility for at least 2 months. We were little disappointed for missing the handover ceremony but all the official formalities were carried out in the presence of local dignitaries/officials and Birthing Centre was officially handed over to the Sannigaun VDC on 16th October as scheduled. Our simple ceremony om 17th October morning with local VDC people who are the most important people to make sustainable Birthing Centre after the handover.